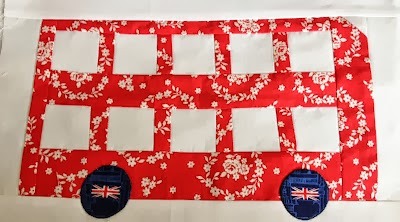 I'm making very slow progress on my London 2013 quilt pattern. I'm enjoying making this fun quilt again but time is a factor this year. This is my double decker bus 2.0. I decided to try making it more traditional bus like in the front. But I think it ends up looking way to school bussy to me. This is the bus block from London 2012. 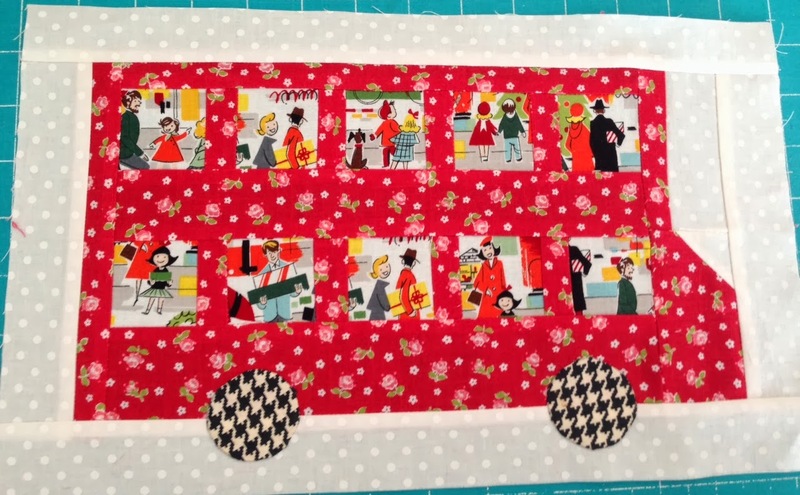 I'm unsure which bus I like more and what bus I will put in the finished pattern. I'm not done tweaking this block yet. I think I like this one more. What do you think? I love the new one but the second one is more true to the real thing! is there a pattern for this quilt? I'm a newcomer to your blog so you may have answered this question already. I love all things British and would like to see the previous quilt. I just love the people in the bus but if you could put them in the second I think I would choose that one. But I know you will make it work. I like the flat front bus.....I too think the top one looks more like a school bus. Could you add the people to the old bus? I like the bottom one better, but like the people in the top one! I like the bus in the second photo the best. It just seems to be more like the "real thing". :-) Happy Monday! I like the second bus. i have yhat people fabric - too cute Nanette! I'm going to have to go with the 2nd bus though -- it looks more like the real thing! Although I like both, I think the second one is more British Double Decker bus. I love the passengers in the first and those wheels, cute! They really are both wonderful, although I think I like the 2012 one the best. Something about those cute London Flag spokes just spells fabulous. Both are great! And I also would love to buy a pattern if you decide to sell them! Could you put on just a small bump- out in the front? Probably not traditional to either bus style but maybe it's what would do the trick...didn't look too bad when I put my finger over half the front of the first one. But then it started looking a tad like a milk or bread home delivery truck that I remember from when I was a little girl. Otherwise, I'd say go with #2. I love all the people in the windows! Adorable Nanette! I like them both, but I really like the people in the windows. You are amazing! As usual I like them both! Love the people in the bus, nice touch - but what a lot of fussy cutting! If I HAD to choose I'd take the first version - it's more British looking...love the wheels! So cute Nanette! I vote for number two... but add the people!